Nina was born and raised in England. She moved to the United States in 1980. B.A. in Graphic Design from Camberwell College of Art, London. Art Teaching Certificate from the University of London. Art teacher at the High School level in London. Director of the Running Ridge Gallery of fine crafts, Ojai, CA. 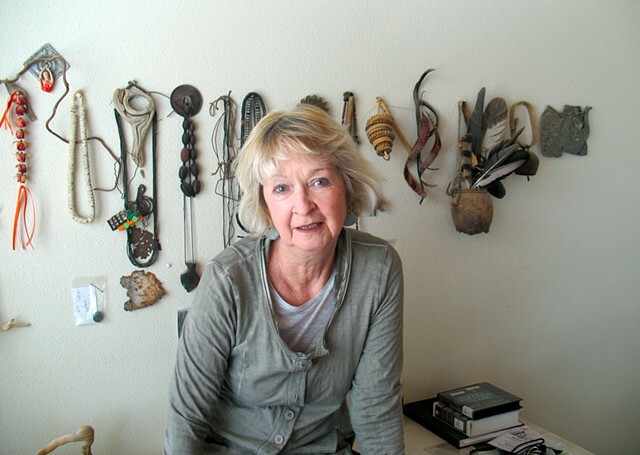 Director of the Running Ridge Gallery of fine crafts, Santa Fe, N.M.
Director of the Jett Gallery of contemporary jewelry, Santa Fe, N.M.
1995 'Myths, Spirits, Rituals', Gayle Wilson Gallery, Southampton, N.Y.
1996 'The Ubiquitous Bead', Bellevue Art Museum, Bellevue, WA. 1998 'The Elements', Gayle Wilson Gallery, Southampton, WA. 2000 'Bead Expo 2000', Contemporary Designer Showcase, Santa Fe, N.M.
2014 'New Art/ New Mexico', Ross Art Museum, Ohio Wesleyan University, guest lecturer. 2006 June, New Mexico Arts and Crafts Show, Albuquerque, N.M.
2009 Parkside Gallery, Carbondale, CO.
2010 Cathedral Park Craft Show, Santa Fe, N.M.
2011 Crested Butte Arts Festival, Crested Butte, CO.
2012 Crested Butte Arts Festival, Crested Butte, CO.
2013 Cherry Creek Arts Festival, Denver, CO.
2014 Cherry Creek Arts Festival, Denver, CO.
2014 Crested Butte Arts Festival, Crested Butte, CO.
2016 Cherry Creek Arts Festival, Denver, CO.
2016 Rio Grande Arts and Crafts Festival, Albuquerque, N.M.
2017 Rio Grande Arts and Crafts Festival, Albuquerque, N.M.
2004 New Mexico Arts and Crafts Show, Albuquerque, N.M. Non Precious jeweler award and Merit award. 2005 New Mexico Arts and Crafts Show, Albuquerque, N.M. Non precious jeweler award, Second place, Jury award, Booth Appearance award. 2012 Crested Butte Arts Festival, Crested Butte, CO. Jurors Award. 2007 'The Art of Jewelry: Wood' Lark Publications. 2008 '500 Pendants and Lockets' Lark Publications. 2014 Belle Armoire Jewelry magazine. 2014 American Craft magazine, special digital edition.